Think you have the best job in the world? Think again! A bold claim I know but how many other jobs allow you to spend your days roaming the Great British countryside (many of our sites are very remote), spotting wildlife, measuring water and making a difference. Oh, and did I mention I also get to drive a 2-metre-long remote-controlled boat? 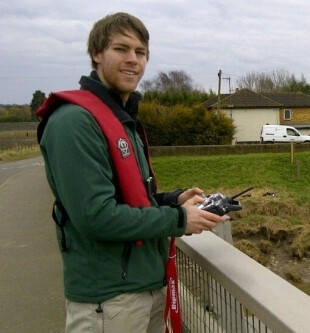 Over the coming weeks, I will be writing a series of blogs to give you a flavour of what my job as a Hydrometry and Telemetry Officer entails, as well as showing you how fun it is as a job and the satisfaction I get from making a difference to people and the environment. I will share with you what I get up to on a daily basis, tell some amusing stories and show how we are working to improve the service we provide to the public. Firstly, I’ll tell you a little about hydrometry and telemetry. You can dress it up with fancy scientific terms, but basically my job is to measure water in the environment (hydrometry), then figure out a way of sending that data back to the office (telemetry). I tend to work on the measuring rather than sending the information back, although everyone has their own speciality in the team. My team operates and maintains a network of groundwater, rainfall and surface water sites. In total we look after 600 sites. The data that my team produces is used right across the Environment Agency, from our teams looking after Water Resources, Fisheries and Biodiversity to Flood and Coastal Risk Management. It is also used by external organisations such as the Met Office, Natural England, the Department for Environment, Food and Rural Affairs (DEFRA), water companies, and even the emergency services. We are constantly looking at innovative ways to enhance the quality of our data and improve individual sites. You could say that hydrometry and telemetry form the foundation of some of the most important functions performed by the Environment Agency. Despite the geeky scientific name, believe it or not, it this can be quite a high-exposure job. Data that has originated from hydrometry and telemetry teams can find its way to news programs, government meetings and important national projects, especially during floods and droughts. Keep an eye out over the next few weeks for my next blog, where I will share one of my favourite routine field days. Interesting stuff, I look forward to reading more. Interesting blog. Good to find out what hydrometry and telemetry is all about. Looking forward to future posts. Keep up the good work! Sounds like a great career! I cannot wait to read more. Intriguing...really interesting stuff ... What we don't see! will fracking interfere with these measurement?